Published on January 25, 2010 in General T&T, PNM, Politics and UNC. 15 Comments Tags: Patrick Manning, Politics, T&T Govt. The PNM does not wash its dirty linen in public. Prime Minister Patrick Manning made this comment during the party’s 54th anniversary celebrations interfaith thanksgiving rally at Balisier House, Port-of-Spain, yesterday. Its theme was “We’ve come this far by faith.” Although he maintained the PNM did not interfere in the politics of other political parties, Manning boasted that the PNM model was the best with regard to internal organisation and discipline. “We take careful note of what goes on in other political parties…We want to know what not to do,” he said. He then waded into the practice of washing dirty linen in public. “If you find dirty linen being washed in public, it has to do with the method of selection,” Manning said. Published on January 25, 2010 in COP, General T&T, Politics and UNC. 20 Comments Tags: Basdeo Panday, COP, Jack Warner, Kamla Persad-Bissessar, Politics, UNC. Siparia MP Kamla Persad-Bissessar last night won by a landslide to be elected the new UNC political leader, while Chaguanas West MP Jack Warner is the party’s new chairman, displacing Basdeo Panday, who founded the party 20 years ago. Panday was the party’s leader and chairman. 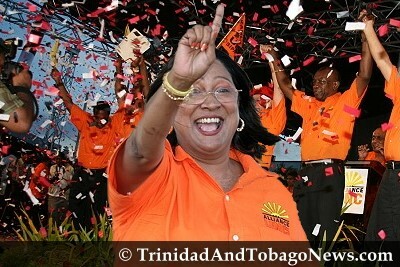 Siparia MP Kamla Persad-Bissessar has put a sound licking on her two rivals to become the new leader of the United National Congress (UNC). In the process, she became the first woman to become the leader of a major political party in Trinidad and Tobago. Although results were trickling in at UNC headquarters at Rienzi Complex, Couva, Persad-Bissessar was clear in the lead in most of the 28 polling stations. Chaguanas West MP Jack Warner was also heading for a landslide victory against St Augustine MP Vasant Bharath. Published on January 25, 2010 in General T&T, Politics and UNC. 8 Comments Tags: Basdeo Panday, COP, Jack Warner, Kamla Persad-Bissessar, Politics, UNC. Joining Persad-Bissessar in the leadership rung is Chaguanas West MP Jack Warner who has won the chairmanship, also by a landslide. The triumph of Warner, who was essentially on his own, attests to his personal strength within the party. Excoriated as a weakling incapable of leading and hiding a drinking weakness, Kamla Persad-Bissessar proved last night she had the political strength to beat two political legends.